I heave myself against the rough wooden door, and sink in to Cicada. Into the warmth, the darkness that feels like a fireside even in the summer when Cicada’s fireplace is unlit, and the feeling of being the only guests there. 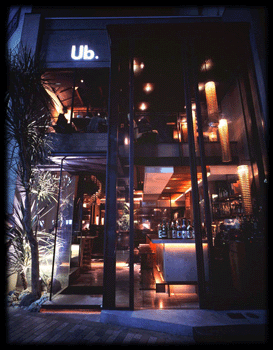 I am whisked past the gold glow of the bar area, and I suddenly find myself seated in a shadowy corner drinking the fruitiest sangria, and taking occasional sips of my date’s stellar mojito. The waiter had come and gone so seamlessly I’d barely noticed. And while part of my wants to curl up and roast smores, I am becoming giddy with the summer feeling of sangria on the beach. Keeping my lips to my straw, I fall in to the menu. The pages of intriguing options fly around my head and I become quite sure I will not be able to pace myself. Lamb Tagine? Asparagus with Hazelnut Salsa? Clams with Chorizo? Hummus? Gnocchi? Something from the impressive cheese list? Sumptuous sounding dishes jump off the page and I start to think one of each might be the only way to go. But we are only two, so let’s be reasonable. Olive oils to choose from first —do they really make olive oil outside Italy? My date and I are happy to ponder this question, but skip the French and Californian options just the same. Our warm flatbread is a tasty teaser and we are happy with our olive oil choice. Meals somehow get chosen, and once we are done, it’s time to peruse the lengthy wine list for more meal accessories. With the first dish I might worry that we will peak too soon, but worries seem to be kept at bay, seeing as how I can’t stop grinning as I eat the spicy Moroccan crab cakes. Light and slightly crunchy with no heavy bread flavor, they are topped with a brilliant green sauce of coriander, lemon oil and orange juice. The tastes meld together, tangy and moist, and I am completely taken in. It is almost a little sad when the plate is empty, but onwards to the rich and hearty Portuguese meatballs. 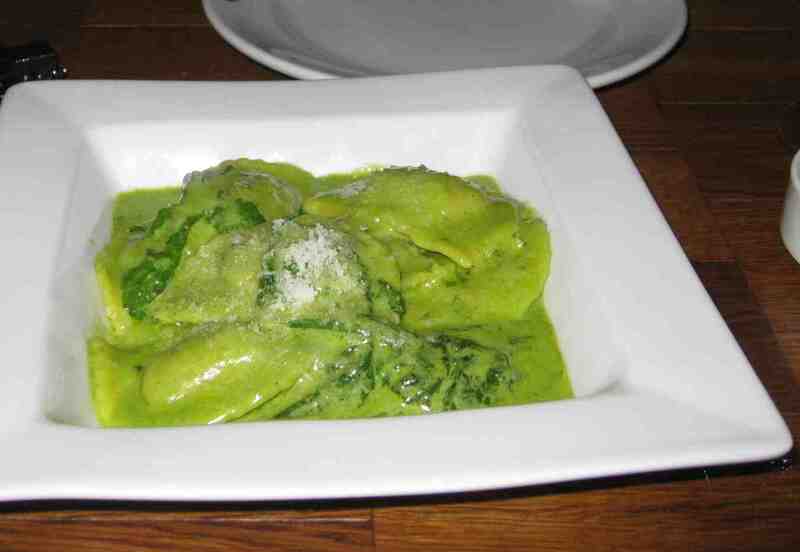 Further on to the velvety ravioli in spinach crema sauce with rucola. Lord, I love rucola. We are already so head over heels into our meal. Although I find the following snapper with potatoes, olives, and rosemary a little too salty, the fish skin is crispy and the meat itself broiled to perfection. Our heady bliss is renewed as the roasted lamp chops with anchovy and rosemary are delivered. We find they match perfectly with the red wine we’ve moved on to, and as we surreptitiously try to gnaw on the stubborn sinews of meat still left on the bone, we start to notice the sleepy satisfaction in our stomachs. But no matter, it is dessert time now, and our sweet teeth have been jealous for some attention. My Valharna 70% cacao rare cake with chocolate gelato, whipped cream and strawberries, is warm and soft, not oozing. A small bite seems to last, imperceptibly melting in my mouth for days, and yet I take another, and another. 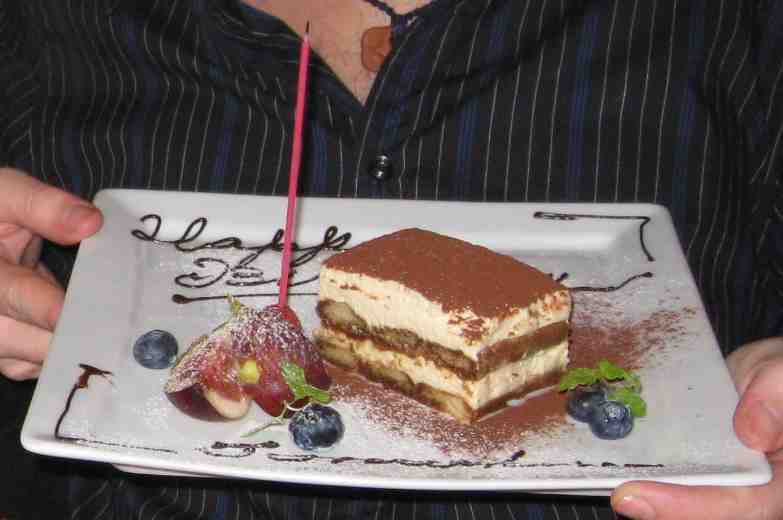 My date tries his tiramisu and moans aloud. The lady fingers are perfectly soaked, the ratios of each layer perfect. While I’m not sure exactly what about it makes it a “Cicada style” tiramisu as the menu states, it certainly fits with the entire Cicada experience, which has left me utterly transported. And days later, when I walk by, I have this urge to press my nose up against the glass. It’s four in the afternoon, and they are closed, and my mid-week me doesn’t have time for a break anyway. Still I glance back as I walk away, wanting so much to escape there again.